Topics: Nergdasm Noire Network is in the finals for Best Group Blog in the Black Weblog Awards and you can nominate us in The 2012 Stitcher Awards. You can read more about it in Nerdgasm News #18 post! We also discuss what superheroes deserve their own movie, rumor of 32GB Nexus 7 tablet, Community premiere is delayed, and Lifetime remake of Steel Magnolias. I began my "Black Girl Nerd" write-ups on a past blog for a reason: to expand not only the face of, but the conceptualizations of what geek and nerdom entail. It wasn't enough that me and a few of my friends (and boy do I mean, a few) fellowship in all things geek but that geek knowledge operated almost like osmosis. To anyone interested. That's nothing remarkable. It seems an infinite number of critical thinkers utilize their verbosity to centralize people of color in various subcultures. It's a continuous topic because visibility, or lack thereof, is still an issue. And the more repetitive this topic becomes, hopefully the more we began to equate geek and nerdom as race (and gender) neutral. Further is the hope that this translates in pop culture mediums. NBC's Community is a great example of multiple characters of color who captivate the show's fanbase due to their esoteric references and cosplay. 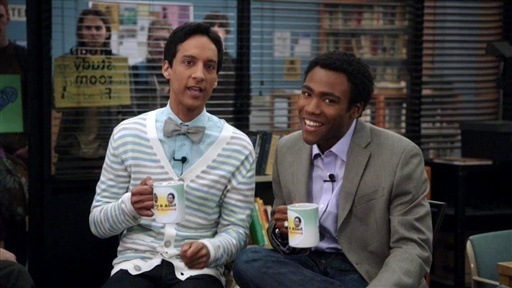 Troy and Abed's friendship provide more geek than token, albeit with a few problematic storylines within the frame of ethic and religious culture to match. The discourse rages on most likely because this likens itself to how we as a society grapple with identity in general. In our postmodern (or any other avant-garde coin word you can think of) world, everyone, whether they admit it or not, cannot imagine anyone under a rigid stereotype. At the least, they mold their prejudices of someone around a group of stereotypes. We've been exposed to way too much "difference" to make myopic assumptions about people and who they are, whether it's based on race, gender, sexual orientation, and so forth. This is not to say people still don't utilize this archaic practice. But I will argue that they certainly struggle with it. I loved Malcolm Barrett's quirky scientist Lem Hewitt on ABC's Better Off Ted. One of the oldest major television networks greenlighted a comedy series' where the one starring person of color didn't go to Black Acting School. Lem was a good balance of race awareness in an early season one episode blatantly titled "Racial Sensitivity" and his overall presence as an overacheiving scientist in the shadow of his famous mother. If I could gander a guess, it was a challenge to the American audience. Of course the question now is, can there be more than that "just one". Why do people still throw around the name "Urkel" to describe the non-white kid that doesn't fit someone's mold. Wait, do people still do that? Do people today even remember Urkel? Probably not those 20 and under. We're slooowly seeing more and more representations of geeks/nerds in television and pop culture, ensuring that there are more examples to choose from when we decide to have these kinds of conversations. Needless to say, this is a good thing. Because at the heart of this issue is the very real desire to be naturally perceived as complex human beings, a right that has been denied to many over centuries simply for looking and being different from another. Which in point, we're all different from each other to a degree but I suppose that premise is best left to the philosophers. NNN Episode 64 - Kia Who? Trust me, if this broad went missing from NBC's lineup in favor of Community? NO ONE would miss her. What is the Peacock Network if not consistently disappointing? NBC, in its infinite wisdom, has decided to shelve Community midseason to make way for 30 Rock. While I don't begrudge 30 Rock its slot, why can't we have both and scrap the show with the annoying brunette pictured on the left? Let's face it: Whitney Cummings is phenomenally unfunny, and the primetime vehicle bearing her name is an affront to the craft of comedy itself. If I wanted to sit through a half hour of painful dialog, exaggerated facial expressions and nonsensical plots, I'd turn to TVOne and watch a Martin rerun. But, no. Whitney gets a stay of execution while Community gets the "indefinite hiatus" shaft. Though network brass took steps to reassure fans the show wasn't canceled, they aren't exactly sure when it's coming back. Many writers and critics have made the case for saving this show, and in a much more articulate way than I ever could. For me, this sitcom is something of a rare occurrence in which everything comes together so perfectly that you have to pinch yourself to know that it's real. Fearless, imaginative writing. A strong ensemble cast. Storylines that artfully weave humor and whimsy and still manage to sneak in a lesson or two without the usual ham-fisted preachiness. You can't help but root for Community's band of misfits, even Chang, who--in the real world--would be in an asylum by now. Meanwhile, NBC has ordered a pilot of...wait for it...wait for it...The Munsters! The project, headed by Pushing Daisies's Bryan Fuller, promises to be a darker, edgier version of the cult classic, in the vein of current shows like Grimm and Once Upon A Time. Unless I see Herman snorting a line of coke off of Lily's bare back while shooting mobsters? I think I'll pass.